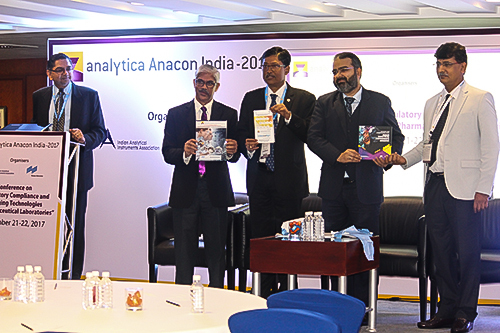 The 12th edition of analytica Anacon India and India Lab Expo successfully concluded in Hyderabad at HITEX Exhibition Center. With 9,641 visitors and 261 exhibitors, analytica Anacon India, India Lab Expo and PHARMA Pro&Pack Expo has chalked up the best- ever result in its decade-old history and surpassed all expectations. The number of visitors rose by 25% over the previous edition in Hyderabad. Jointly held with PHARMA Pro&Pack Expo for the second year, the synergies between the trade fairs has resulted to setting of new records. 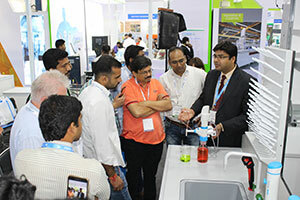 Visitors from pharmaceuticals, chemicals, food processing, research and development among other segments explored the latest innovations from the laboratory technology, analysis, biotechnology, diagnostics, pharma packaging and processing. Almost all top companies within and around Hyderabad attended in large numbers and delegation trips were arranged by Messe Muenchen India for several companies. Focussed conference titled - Analytical Solutions for Life Science Research - where industry stalwarts shared deep comprehensions about the stateof- the-art development in the analytical industry. The event garnered 12 speakers and 150+ attendees. The latest analytical technologies and innovations were presented by the exhibitors at the trade fair. 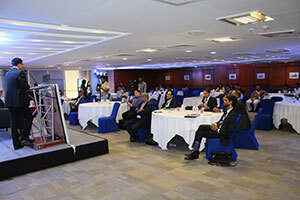 Renowned speakers and 100+ attendees participated at the event. A unique platform to connect buyers and sellers from pharma, analytical and laboratory instruments. This year 912 (HYD) and 350 (MUM) pre-scheduled meetings were conducted. The event focused on 'Building your lab for tomorrow'. 10+ speakers and 100+ delegates shared their thoughts during the event. We are very bullish about the prospects for business at Hyderabad, as it is a very important market for the Pharmaceutical and the scientific research industry, and that is the reason for us being here. We have some good quality footfalls on the first two days and are looking forward to more numbers by day 3 of the trade fairs. The Trade Fairs also provide a very good platform for us to connect informally with the entire community and we shall be here next year as well. Mr. Rovino Rodriques, General Manager Product Management & Marketing, Borosil Glass Works Limited. 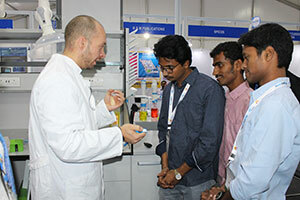 We are extremely happy to participate in analytica Anacon India & India Lab Expo at both the locations. We are very pleased with the results at both cities and have had the opportunity of interacting with several customers. We are always happy to participate in these trade fairs. We participate every year at analytica Anacon India & India Lab Expo and PHARMA Pro & Pack Expo and showcase our new products to prospective customers and business partners. The trade fairs continue to be a great platform where we keep interacting with the industry stakeholders, and it definitely helps in building our influence within the analytical industry. Mr. Girija S. Brahma, Marketing Manager, MERCK Life Science Pvt. 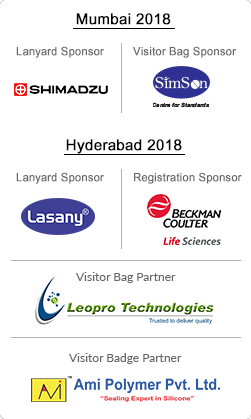 Ltd.
We have been at analytica Anacon India & India Lab Expo for the last 4 years and we come to Hyderabad since it is a very good market for the pharmaceutical sector. We found that the people who came to ourbooth are interested in our range of products. The exhibition has been successful in developing our business in these 4 years and we will continue to participate at the trade fairs to grow our business further. Keith Hulme, Director, Starna Scientific Ltd. 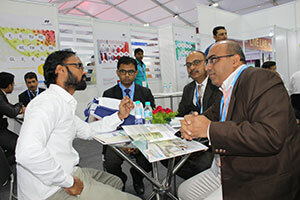 This is our 2nd year of participation at analytica Anacon India & India Lab Expo and PHARMA Pro & Pack Expo. The footfall has been very good and has provided us with leads enabling us to meet with new and relevant customers. These trade fairs have helped us generate new business leads for our company. We look forward to participating on a bigger scale in coming editions. Dr. Neeraj Khurana, Head – Marketing and Applications, Beckman Coulter Life Science India. It was a good decision to be a part of analytica Anacon India & India Lab Expo, we developed some good business connects. The footfall was good and we got to meet with a number of new visitors and key players who participated at the Trade Fairs. We are looking forward to participating in the next edition of the trade fairs at both Hyderabad and Mumbai. We are a upcoming company in the manufacture and export of laboratory glassware, since many years to Europe and America. The trade fairs have been an excellent platform to meet prospective clients and demonstrate our technology, at the same time get exposed to new technologies and the latest developments in the market. Mr. Gagan Bagga, Vice President Operations, Glassco laboratory Equipments Pvt. Ltd. This is indeed a great platform for the Pharmaceutical industry where as we are part of the Buyer-Seller forum and get more information about various technologies and instruments on a single platform. I would like to thank to the organisers who have done a great job with these trade fairs, as well as conceptualising the buyer-seller forum. Dr. Atul Kolte, Group Leader, Hetero Healthcare Ltd. I have visited the show as a Buyer to explore different types of instruments and services from the manufacturer. The exhibition is good and the Buyer Seller Forum has helped me understand specs ofdifferent instruments. Mr. Sanjay Hiralal Gupta, Assistant Manager – Engineering, BioGeonomics Ltd. I think this trade fair is beneficial to the life sciences industry and I fully encourage the organisers to go bigger and better going forward as well. The Buyer-Seller forum has been really well managed at these trade fairs. We would really like to participate again and shall be here in the next edition of the trade fairs. We were able to meet several buyers and sellers in these meetings and really look forward to supporting the Trade Fairs as it grows from strength to strength in the years ahead. I would like to thank the organizers who have invited me to attend these Trade Fairs. It was a great opportunity to participate at the Buyer-Seller forum, as we got invaluable information about the latest trends coming up in the market. This Forum also helped us meet and interact with different professionals and provided us with information about new equipment being used in the laboratories.